A 2 M.G.D. plant was completed in 2010. This is a state-of-the-art plant with a brand new sludge-dewatering facility that will serve the citizens of New Caney for years to come. Crews are working every day to insure that all 23 lift stations are working properly. Lift stations pump the waste water to the Sewer Treatment Plant. Smoke Testing: How it works? 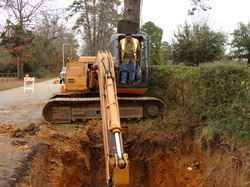 Crews will continue to smoke test the sewer lines in and around all neighborhoods. Smoke testing is a fast and easy way to find leaks and holes in the sewer collection system. A smoke-blowing machine is used to force air and smoke down a man hole and through the pipes underground. The smoke is then forced out any broken pipes or clean-out tops. The chemical we use to make the smoke is non-toxic and harmless to humans and pets. Smoke will also be seen coming out of the vent pipes on top of homes; this means the vent pipe is working correctly. If you have smoke enter your home, there is a broken vent pipe. This means that sewer gas can also enter your home. If you have any questions about smoke testing, ask a crew member on the job or call our office. When there is a hole or break in the sewer line, storm water is allowed to enter and fill up the collection system. This causes back ups and overflows. If you find a broken clean out or damaged man hole, please call and report it.